Cycle through beautiful rural landscapes dotted with ruins of ancient civilisations and small towns where Buddhist temples nestle amongst graceful French colonial buildings and ramshackle houses. 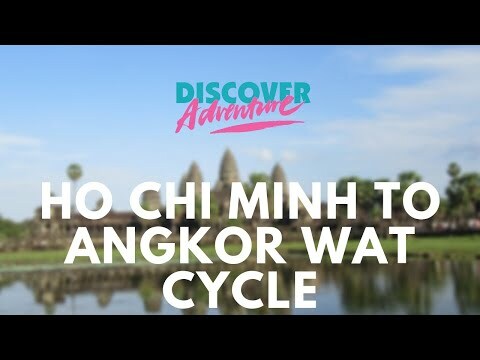 Our challenge takes us from Vietnamese Saigon, now Ho Chi Minh City, through the rice-paddies and waterways of the beautiful Mekong Delta into Cambodia. We pedal on through this friendly country towards one of the most impressive sights in Southeast Asia, the Royal Temples of Angkor Wat. The fascinating insight into the region’s cultures, ancient and modern, are a real highlight of the trip. On arrival we transfer to our hotel and have a trip briefing before getting a good night’s sleep, ready for the start of our challenge! Night hotel. After an early breakfast we drive (approx. 1.5 hours) out of the bustling city of Ho Chi Minh to the famous Cu Chi Tunnels. A sanctuary for the Vietcong at the height of the Vietnam War, they give us a good insight into the country’s relatively recent history. We then drive south towards the Mekong Delta (approx. 2.5 hours). We stop near Ben Tre, the gateway to the Mekong Delta, and after lunch and ensuring our bikes are comfortable, we set off! It’s a wonderful place to start our ride. We cycle on narrow lanes and tracks through the heart of this rural area, passing banana plantations, sugar cane fields and the lush rural landscape of the Delta. We have a short ferry crossing before reaching Tra Vinh. Night hotel. Our first full day’s cycle takes us along quiet backroads to Can Tho, the largest city in the Mekong Delta, known for its picturesque canals full of scenes of everyday life. En route we pass numerous Khmer temples and pagodas, and cross several waterways – some by footbridges, some on ferry crossings. We will start to get a great feel for the friendly Vietnamese culture, and the traditional rural scenes we see are fascinating. We ride today on a mix of roads and tracks; most of it is very quiet, but the last section gets busier as we approach Can Tho. Night hotel. After an early breakfast we set off by boat through the Can Tho floating market, seeing a multitude of boats trading livestock, fruits, rice and fish. We then get back on our bikes and cycle along the banks of the busy river continuing towards Sa Dec. After lunch we cycle upstream alongside the river towards Long Xuyen. This is a beautiful day, with some wonderful photo opportunities. We end our ride at a bird sanctuary, home to thousands of storks – we can have a quick visit to see them before loading up into the vehicles for a short transfer (approx. 45 mins) into Long Xuyen. Night hotel. Our last day of cycling in Vietnam! A short transfer (30 mins) allows us to avoid the traffic, and we set off. Our route starts to undulate a little as we near the hills near Chau Doc; although these climbs are fairly gentle, our leg muscles have become used to flat terrain so they often feel harder than they really are! The heat, moreover, makes them feel tougher. We cycle via the Killing Fields at Ba Chuc, where Pol Pot’s regime massacred over 3000 Vietnamese people in 1978; harrowing history. We continue our ride to the busy town of Chau Doc. Night hotel (near border). Today we set off early, heading north towards Phnom Penh. After around 20km we reach the border with Cambodia and meet our new guides who will be waiting for us. We then head off through the lovely rural landscapes of Cambodia. At the small town of Takeo we load up into the buses, which take us the remaining distance to Phnom Penh, stopping en route to visit the infamous Killing Fields, which are harrowing but compelling at the same time. We then arrive at our hotel in Phnom Penh; once considered one of the most beautiful cities in the Orient and which, despite its turbulent recent history, retains a colonial charm. Night hotel. We start our day with a visit to the Tuol Sleung Museum, or School 21, a former school which was turned into the notorious Khmer Rouge interrogation camp during the Pol Pot regime. Although it tells a tragic story, it is a fascinating place to visit and essential to understanding present-day Cambodia. We then leave Phnom Penh by bus (approx. 1 hour) to avoid the city traffic before we start our ride. As we head to Udong we see the rice paddies stretching out for miles, busy with workers in the fields. The roads in the region tend to be a rich red which is very striking against the dazzling green paddy-fields – be prepared to take lots of photos! We ride through Udong, once the ancient capital, and pass by a hill temple with stunning views of the fertile region and many of the old Royal Palaces. Continuing on, we cycle towards Kampong Chhang and the enormous Tonlé Sap Lake. Night hotel. A beautiful boat ride awaits us this morning, as we cross the immense Tonlé Sap. The largest freshwater lake in South-East Asia, it features an incredible biodiversity and has UNESCO biosphere status. We enjoy a rest from our bikes as we soak up the views of fishing communities and calm waters. Leaving the boat at Kampong Khlaeng, we ride on small roads through beautiful landscapes and villages, heading towards Siem Reap. This area is unspoilt and very traditional, and it’s a lovely quiet ride to savour before reaching the main tourist draw of Angkor. Meeting our vehicles, we load up before reaching the busy streets and drive (approx 30 mins) into Siem Reap, the closest town to the temples. Night hotel. Today we ride to the famous World Heritage site of Angkor Wat. The area is dotted with many ancient buildings and temples amidst dense forest; the sheer scale of the complex will astound you. We ride a circuit around some of the temples, including Ta Prohm, the best-known of the temples overgrown by trees and reminiscent of scenes from Tomb Raider. Our ride also takes in the Bayon in Angkor Thom, the old city central to the area. It is a fascinating ruin, featuring many mysterious giant carved faces and some incredible wall carvings, and is one of the most remarkable sights in the area. Our ride ends at Angkor Wat itself, one of the most impressive and best-preserved temples of the complex. If there’s time, it is worth climbing the remarkably steep and narrow steps of the central spire for the view over the whole temple surrounded by jungle. It’s a wonderful place to finish our challenge after 500 hot kilometres across two countries! After the obligatory group photos we transfer back to our hotel (approx. 30 mins) and should have some free time this afternoon to spend as you wish – relax at the hotel, or explore Siem Reap’s markets for last-minute shopping opportunities, or visit more of the temples. We meet again in the evening to celebrate our achievements. Night hotel. We stay in a variety of hotels/lodges ranging from quite simple, friendly guesthouse-style to more international-style hotels in larger towns or cities. Standards are generally good, in great locations, but there may be a night or two where facilities are more basic, as you'd expect in very remote, untouristed or rural areas. Only a short flight from Siem Reap lies the Gulf of Thailand, with its long curving golden beaches and clear blue sea scattered with tiny islands. Here you can relax! A boat trip allows you to discover unspoilt islands offshore, where pristine white-sand beaches and swaying palms fringe the interior rainforest. Snorkel among pristine coral – you may see stingrays as well as the many colourful tropical fish – and after a seafood BBQ on the beach and plenty of time to relax, the boat brings you back to the mainland. You will stay in a plush 4* beachfront hotel with wonderful bungalow rooms, on a quiet area of the coastline. Otres is not known for its parties or large resorts, and it’s the perfect place to get away from it all. An excellent adventure for wildlife spotting! The local guides were extremely supportive and helpful, and the food plentiful and tasty. The hotels were of a very good standard, and even the hostel was much better than expected. 100% success in all areas of the challenge. Thoroughly enjoyable in all areas. Leadership outstanding, challenge spot on and the enthusiastic help from head office to get you on the road just made everything stress free and so enjoyable. If you want to see Vietnam and Cambodia and immerse yourself in the country this is a great way to explore, meet the people and enjoy a challenge. The team were also supportive and informative! Read more + good mixture of terrain and landscapes. Loved everything about this experience - it was life changing - great team and look forward to my next DA experience! This challenge pushed me to my limits. I cycled in conditions I would never have thought I would, but I was always encouraged and supported by DA team, and local crew were fantastic. Read more + person who contacted me and that I could discuss trip/travel plans with. Also the regular emails prompted me to get ready for the trip as the weeks came around quickly. The DA and local crew on the trip were so welcoming and supportive. The whole ride was seamless and a privilege to be part of, with the chosen routes allowing us to see parts of the countries that the average tourist would not see. And to top it off I have made friends for life! Would 100% do the whole thing again! Read more + some really lovely people. I couldn't recommend this adventure enough! Seemed effortlessly organised which meant we were able to maximise our experience. Rated: 5* A truly amazing trip - very well organised throughout by Discover Adventure. Local staff members were willing, helpful and a pleasure to be with - and ably led by Caroline and Cookie. A privilege to be part of such a great group of fellow cyclists. Everything about the trip is an adventure - take you're sense of humour , open mindedness and willingingness to try your best and Discover Adventure will do the rest - experience of a lifetime and sad it's over! A fabulous way to discover a country - to see villages and communities that are inaccessible any other way. I felt privileged to have had this experience. The DA experience provided a wonderful mix of physical exertion, sightseeing and education and making new and firm friends. The lasting memory is of a sense of achievement whilst having had a lot of fun! The Ho Chi Minh to Angkor Wat challenge was fantastically well organised and executed. We could not have been better looked after, while the country was fascinating and the food was terrific. Rated: 5* Faultless. A fantastic experienced enhanced by knowledgeable, helpful and friendly crew. Rated: 5* Absolutely fantastic ride to see both countries in 12 days, I highly recommend this challenge - so much so that I'm doing it again in 2018. It's the best way to sample the culture! Read more + experience at the same time. The diversity - one minute we were cycling through small villages the next paddy fields, the next busy roads, markets, towns. Loved the way the cycling was interspersed with visits to temples, floating markets etc. Read more + themselves on this trip - Vietnam and Cambodia are two beautiful countries; there is no better way to see them than by bike but the staff on this trip (Leaders Christina and Mel and the Drs Becky and Kate) were so friendly, motivating and supportive they really did a great job and are a credit to the company! I had such an amazing time and cant wait to book my next adventure! Discover Adventure continues to inspire me to greater heights. Would trust them with my life! The world is a small place - let Discover Adventure take you to places off the beaten track and live life a bit differently. Read more + scenery up close and personal. It was an absolutely fantastic 'life experience'. A truly heartwarming trip through stunning scenic locations. This is an amazing adventure and is the only way to see the real Vietnam/Cambodia. Read more + traveller as I was always made part of a group. The whole experience from start to finish was amazing. The staff and crew were lovely and extremely helpful. It was a perfect way to experience the countries and take a peep into the lives of the villagers. The whole experience from registering to doing the challenge was excellent. The challenge itself was a great experience seeing parts of Vietnam and Cambodia that tourists would never see. The rain was something you cannot explain until you have ridden in it. Great trip! The DA team were first class in every part of it.